Many Britons planning to fly out to the Far East for a holiday in Vietnam will no longer need to go to the trouble and expense of getting a visa, it has been announced. The announcement by Nguyen Tan Dung, Vietnam's prime minister, means that from July tourists from the UK, France, Germany, Spain and Italy will not require a visa if they are staying for 15 days or less. 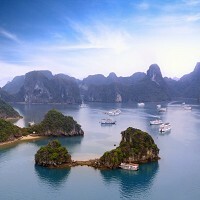 Designed to give Vietnam's tourist industry a shot in the arm, the move has been welcomed by tour operators. During 2014, almost eight million foreign nationals visited Vietnam, many of them covered by a worldwide travel insurance policy. But between January and May this year, the number of arrivals totalled just 3.3 million, 13% less than during the same period last year. Arrivals from Europe were down by 7% with Russian tourist numbers falling 16% during the first five months of 2015. The decline in the number of visitors from China, meanwhile, has been even sharper, falling by 30%. The Chinese stay-away comes in the wake of the anti-China protests that were triggered by its placing of a huge oil rig close to the Paracel Islands last year. Hoang Le Quyen, of Ho Chi Minh City-based PeaceTours, predicts the visa move will result in more people visiting Vietnam and says it is fantastic news for the country's tourist industry. But she adds that with Vietnam competing for tourists with Thailand, Malaysia, Singapore and other countries which offer longer visa-free stays, it would be better if the Vietnamese authorities allowed people to stay for up to a month without having to get a visa. Until now, Vietnam has permitted travellers from four Nordic nations, Russia, Japan, South Korea and Belarus to visit without a visa. It also has a reciprocal visa exemption agreement with nine south-east Asian countries. But now, as it attempts to revive its tourist industry, the Vietnamese government is looking into the possibility of introducing visa exemptions to more countries.